PLAYER VERDICTS: No real credit for any Peterborough United player from a dismal all-round display. Posh striker Lee Angol runs at Oldham skipper Peter Clarke. Photo: Joe Dent/theposh.com. 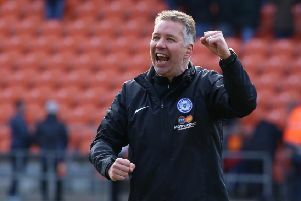 Posh were shocking going forward and only a reasonably strong central defensive effort kept Oldham at bay until midway through the second half. Posh skipper Chris Forrester is surrounded by Oldham players. Photo: Joe Dent/theposh.com. Junior Morias: (for Nichols, 74 mins).